Shown and not reviewed: The Fall 2102 Highlighter.. passed because I really do not need another. Sorry! It was a finely milled, shimmery light gold powder. Beautiful but I couldn't justify it. 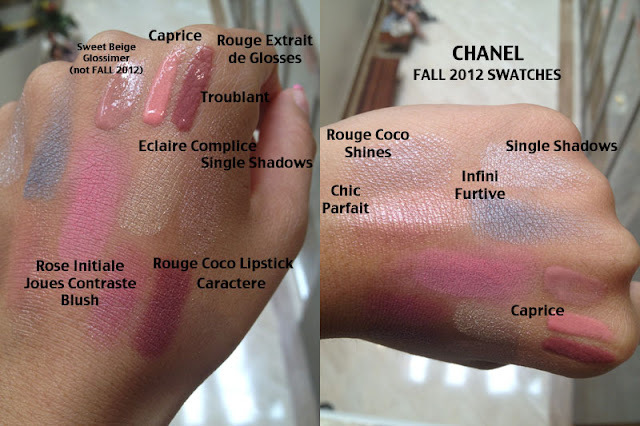 And last, but not least.. swatches of most of the Fall 2012 Collection. I left out the eyeshadow quad, Premier Regard and Waterproof Liners because they're pretty straightforward. I'd totally go for the blush this time...it has the perfect rosy pink factor I love. Per your recommendation, I ended up buying the Frenzy nail polish. It's my first Chanel polish, and WOW...the formula is impressive. Dries fast and it's so smooth. Thanks, Rae!